Try one of these mouth-watering Hanukkah recipes from India, Yemen, Italy or Mexico. With eight days, and three meals a day, Hanukkah offers ample opportunities for trying out all kinds of fried foods. You can definitely find enough latke and sufganiyot (donuts) recipes to fill up every day of Hanukkah (and then some), but there’s fortunately a world of oil-centric food customs throughout the Jewish diaspora that are worth adding to the mix. Eating fried food is meant to remind us of the miracle of Hanukkah, when oil that seemed to be enough for only one day of lighting the eternal flame lasted eight days in the Temple. Here’s a roundup of Hanukkah dishes from around the world that might make your holiday feel more miraculous. This is the buttery, flaky, decadent fried bread dreams are made of. Malawach is a staple food of Yemenite Jews, and not just at Hanukkah time. Yemenite Jews brought the tradition of making fried bread with them to Israel, where it’s become a popular comfort food. The great thing about malawach is that it makes an awesome breakfast food. While rich and buttery, it’s also flaky and light. It’s often topped with eggs, dipped in zhug, or served alongside Israeli salad and hummus. Get the recipe here from Food52. Seriously, is there any better fried food than fried chicken? I’ve long wondered why fried chicken doesn’t get a bigger shout-out at Hanukkah. Fortunately, the Italian Jews understood the power of fried chicken so well that they have a fried chicken recipe JUST FOR Hanukkah. This is no ordinary fried chicken; it gets marinated in lemon, garlic and spices before it takes a dip in batter and gets crisped in oil. Thank you, Italy! Get the recipe here from Serious Eats. Two words: fried + CHEESE. 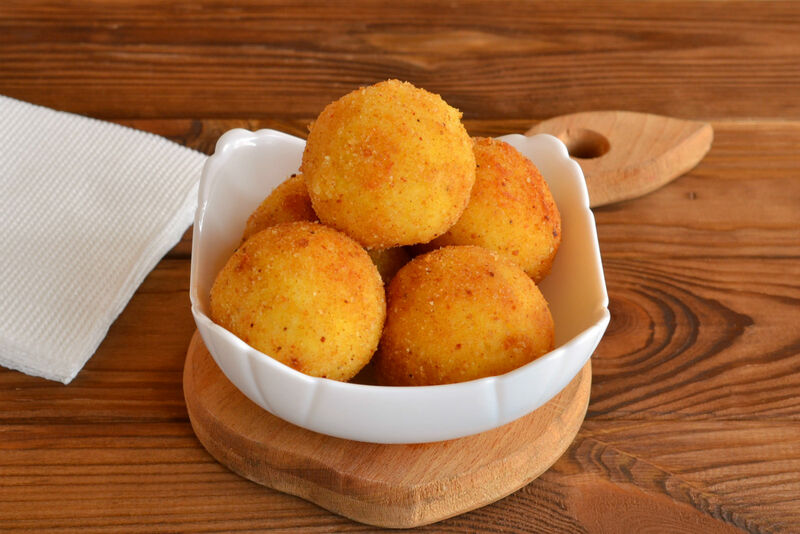 For these Mexican croquettes, multiple cheeses get combined and mixed with matzah meal, then they’re formed into balls and deep fried. Served with the suggested spicy sauce that cuts the richness with heat and acidity, you have a recipe for a fried food that has tons of flavor and is over-the-top celebratory. Get the recipe here from Saveur. If you want to try something other than sufganiyot, Moroccan sfenj are made with a simple dough, and then it gets fried and covered in honey and/or sugar. It’s very popular with Moroccan Jews, and it’s also commonly made throughout North Africa and the Middle East. It’s the perfect pastry to accompany a pot of hot fresh mint tea. Get the recipe here. The Cochin Jews of Kerala in Southern India were quite removed from other Jewish communities in the diaspora, and as a result they have a unique repertoire of recipes based on local South Indian ingredients, kashrut and Jewish traditions. 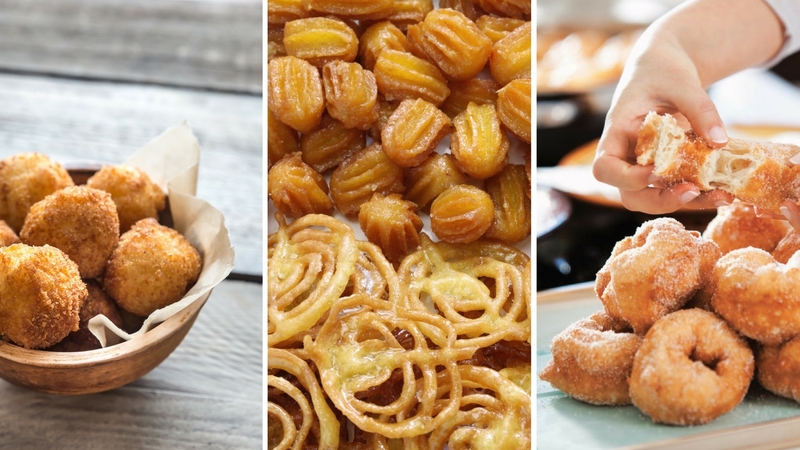 For Hanukkah, Cochin Jews make a variety of fried things, including these sweet fritters. Neyyappam are popular both with Jews and non-Jews in Kerala, and they are made with coconut, dried fruit, nuts and spices. Yum! Get the recipe here from Is That My Bureka? I love almost anything made of chickpeas, and when I discovered this recipe my stomach growled. Sambousak b’tawa are often made by Iraqi Jews in celebration of Hanukkah. These savory pastries gets filled with spiced chickpeas, and then they’re fried until crisp. Once out of the oil, they’re irresistible. Get the recipe here from Ha’aretz or try this recipe for cheese sambussak. While bunuelos (also called bimuelos/levivot) are one of the best-known Sephardic Hanukkah foods, I think the Spanish and Portuguese recipe for berenjenas con miel deserves some attention. This deep-fried eggplant drizzled with honey isn’t your typical fried food; in my book it also gets bonus points for being neither a fritter nor a donut. This dish achieves the great taste trinity of sweet, salty and fried. Get the recipe here from Food and Wine. 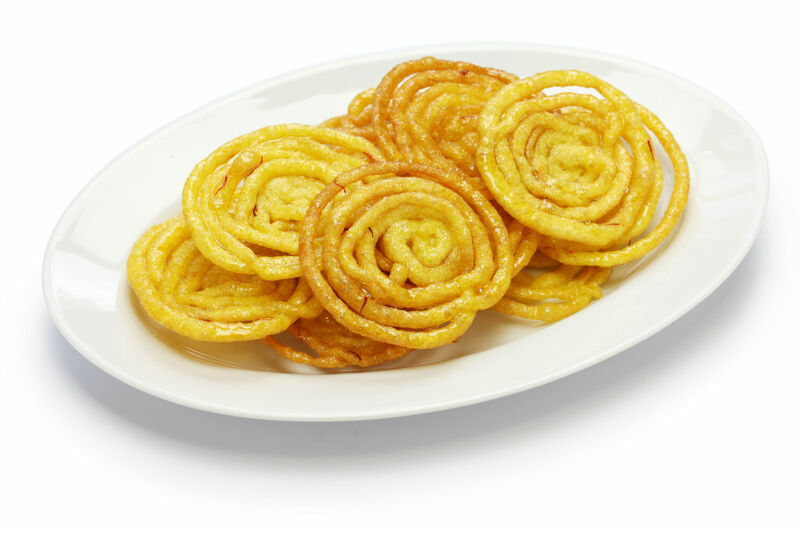 Reminiscent of a classic fair funnel cake, zoulbia are more complex in flavor than their American counterpart. Once golden and fried, these fritters get dunked into a syrup flavored with rosewater and cardamom. The key to achieving their beautiful lacy pattern is to fill a squeeze bottle with batter and then to freeform squeeze that batter into ribbons directly into the hot oil, resulting in one of this list’s most beautiful fried foods. Get the recipe here from All Kinds of Yum.